Oil blotting paper made of premium quality Manila hemp instantly soaks up excess oil and remove shine from your face, without smudging your makeup. Use them to remove oil and shine throughout the day! Softly and gently absorbs excess moisture and oil from the skin's surface. The clear soft case is made of eco-friendly material. Finally - soft blotting films that absorb oil and moisture without smudging makeup. Fine papers are made in Japan with a premium quality Manila hemp, instantly soaks up excess oil and removes shine from your face. Don't cover up your shine - wick it away without any residue! TrueRenu does the searching - and researching - for you. We look for hard to find, hard working products that do what they promise, and we bring them to you with detailed descriptions. 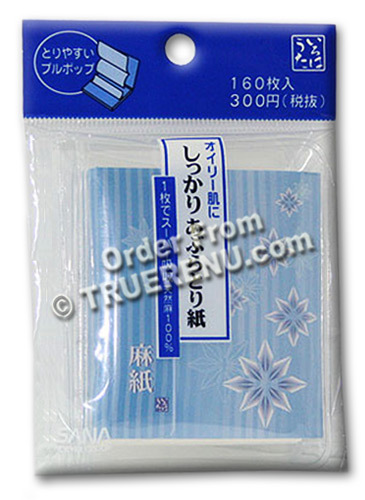 TrueRenu carries a wide variety of Blotting Papers - search for "TrueRenu Blotting Papers". Press a single blotting paper sheet against the shiny areas of your face. Start with the T-zone areas of the nose, chin and forehead. Allow the blotting paper to absorb the oil without rubbing or moving it against your skin.